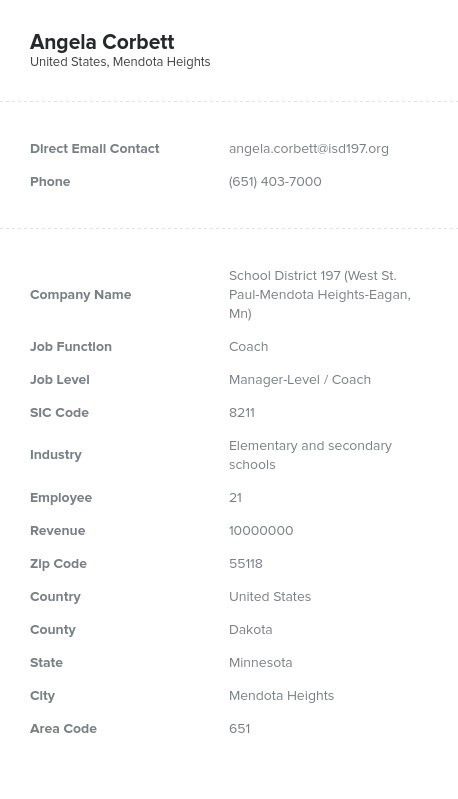 Teach elementary and secondary teachers, administrators, and staff about your company and your product with the help of this accurate, ready-made school email database from Bookyourdata.com. You can find high school and elementary school email addresses and contact information easily after just a few clicks. Find the key contacts at elementary and secondary schools with this accurate, human-verified email list. This contact database consolidates prospects at numerous schools into one useful, easy-to-download file. Find teachers, principals, administrators, and staff at schools who you need to talk to. After buying this high and elementary school email list, you can quickly integrate it into your CRM and start calling, emailing, or mailing teachers as potential sales leads. School mailing lists are perfect for those who plan to market to teachers. Whether you are promoting a book club, sharing an online learning tool, encouraging field trips to your location, or marketing to elementary staff for any other education-related reason, this contact directory is the perfect answer to the question of how to reach out. This particular product contains the verified emails, phone numbers, fax numbers, and addresses you need to get in touch directly. Promote your business in a professional way to those who would be most interested in your products or services. School teachers work hard to educate children and stay up to the high standards of standardized testing. If you have an educational tool or program that can help them teach, then email leads from this helpful school email list and let them know. Buy our pre-built list of secondary and elementary teachers and staff now, or build your own marketing solution with our B2B marketing build-a-list tool.